Some crows eyed the walking duo from atop their perch on a tree, and the walkers eyed them back. “You know crows are quite clever, don’t you Josh?” began Rosh as he stopped to rest beside the tree. “Have I told you the Aesop fable where a thirsty crow on a hot afternoon comes upon a pitcher with some water?" “The Avianus version of this fable says he couldn’t topple the pitcher because it was too heavy for the crow." "Yet the crow gets the water using a strategy, showing that thoughtfulness is superior to brute strength." "But even if the pitcher could be toppled over,” argued Rosh. “The hot parched earth would have sucked up the water instantaneously, long before the poor crow could get a sip." As if he had heard Josh and wanted to protest, the crow called out raucously, staring at them. “Careful Josh. Just because someone looks different, talks different or has a different gait doesn’t make them stupid, and even if they might be stupid it doesn’t give you the right or reason to call them stupid. Birds are definitely not stupid." “What did the crow do, Pa?” asked Josh. “What would you have done, if you were the crow?” asked Rosh instead. “I would have found a straw to sip it up,” responded Josh without thinking. “You’ve been having too many Cokes with straws. Think like a crow. There were no sipping straws around 2,000 years ago,” said Rosh. The crow called again, louder this time. “Well, he flew around till he found a pebble,” answered Rosh. “This he picked up in his beak and flew back to drop it in the pitcher." “That crows are clever. Better not upset them by calling them names,” replied Josh. “Try or die,” said Josh playfully, looking again at the feisty crow to see if he would protest again. “I like them both. The moral could very well have been persistence. Keep trying till you succeed – or die,” Rosh laughed, getting into the mood with Josh, “whichever is earlier." “How did he figure that?” asked Josh curiously. “Remind me to tell you tomorrow. 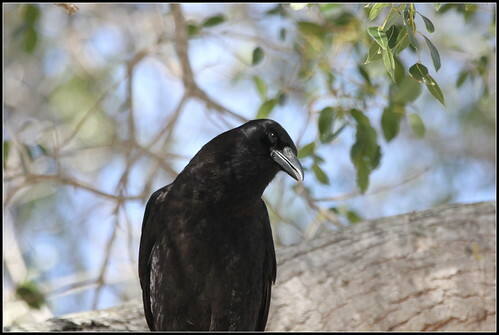 If you are interested, remind me also to show you Youtube clips of some pretty clever things crows have been seen doing. But now, we must hurry back. A storm is on its way,” said Rosh. The crow cawed a farewell as he saw father and son turn back on their way to home.